African eye-ring lovebirds are very energetic, curious birds. They often have very charming personalities, and they can be socialized to enjoy time with humans, although this requires serious daily commitment. Whether you wish to handle them or not, African eye-ring lovebirds are fascinating birds that breed relatively easily when kept correctly. They thrive when kept either individually or in a colony of birds, and colonies often chatter and chirp to each other, which is a beautiful sound. Check that your lovebirds have enough space. As lovebirds love to fly and move around, always provide the most space possible. Your lovebirds will be much happier in a roomy environment that lets them live more naturally. The minimum amount of space for one lovebird is 24 inches (60 cm) wide by 14 inches (35 cm) deep by 30 (76 cm) inches high. Two birds require double the space. Record the temperature constantly for a few days. You can purchase electronic temperature trackers which will do this for you, or make a note of the temperature hourly. Lovebirds can thrive in a variety of temperatures, but drafts and sharp temperature changes can affect both their happiness and their health. If you notice the temperature is not consistent, consider moving the cage. Feed your birds a varied diet. Lovebird pellets should make up around 70 percent of the birds' diet, as these are formulated to contain vitamins and nutrients vital to your birds' health. However, these should be supplemented with leafy greens, carrots and bananas. Lovebirds should not be fed chocolate, avocado, fruit seeds, caffeine or alcohol, as these substances can cause serious health problems. Change your lovebirds water daily, using chlorine-free, filtered water. Try to do this at the same time each day. Birds that are dehydrated or that have limited access to fresh water will not breed. Provide toys to keep the birds entertained. 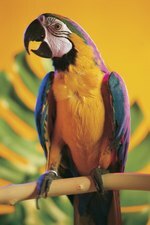 Bird toys suitable for lovebirds are available from most pet shops, and usually feature mirrors, bells or ropes. Lovebirds love to chew and find mirrors fascinating, so these toys will keep them stimulated and healthy. Offer the birds a bath two or three times a week. Birdbaths are available from most pet shops, and if you place these in the cage the birds should bathe themselves. Provide a nesting box. A cockatiel nesting box is perfect, as the bigger size gives the chicks more time to grow. Fill the bottom of the box with a 2-inch layer of a suitable nesting material such as clean straw, shredded newspaper or unscented white towels. Give the birds time to breed. If you have checked all of the above, your birds will be in good condition and should be happy to breed. This can take some time, however, depending on the individual bird.